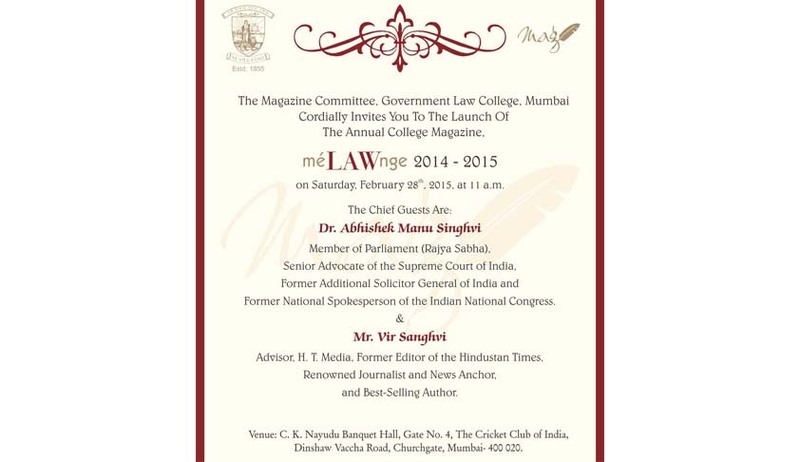 The Magazine Committee, Government Law College, Mumbai cordially invites you to the Launch of the Annual College Magazine, méLAWnge 2014-15. Member of Parliament (Rajya Sabha), Senior Advocate of Supreme Court of India, Former Additional Solicitor General of India and Former National Spokesperson of the Indian National Congress. Advisor, H. T. Media, Former Editor of Hindustan Times, Renowned Journalist and News Anchor and Best-Selling Author. Venue: C.K. Nayudu Banquet Hall, Gate No. 4, The Cricket Club of India, Dinshaw Vaccha Road, Churchgate. The Chief Guests will formally launch méLAWnge 2014-15. Dr. Abhishek Manu Singhvi will address the gathering. Mr. Vir Sanghvi will address the gathering. Journey through the pages of the Magazine. Mr. Girish “Bobby” Talwar, author of an article in the ‘After GLC’ section of méLAWnge 2014-15 and ex-student of Government Law College, Mumbai, will address the gathering. Select students of the college will showcase their literary skills by reading out their articles from the Magazine. Mr. Shardul Thacker, Senior Partner, Mulla & Mulla & Craigie Blunt & Caroe, will address the gathering and felicitate the winners of the Sir Dinshah Mulla Legal Essay Writing Competition 2014-15. The winners of the Belles-Lettres: J. E. Dastur Memorial GLC Short-Fiction Essay Writing Competition 2014-15 shall be felicitated. The winners of the 14th Vyas GLC National Legal Essay Competition 2014-15 shall be felicitated. Address by Prof. Dr. S. Bharwani. Address by our Faculty Advisor, Prof. Mr. H. D. Pithawalla. Vote of thanks by Ms. Maithili Parikh, Chief Student Editor. Lunch will be served thereafter. Please don’t forget to collect your copy of the Magazine!